I am back friends! Sorry for the extensive delay, I have no excuses! 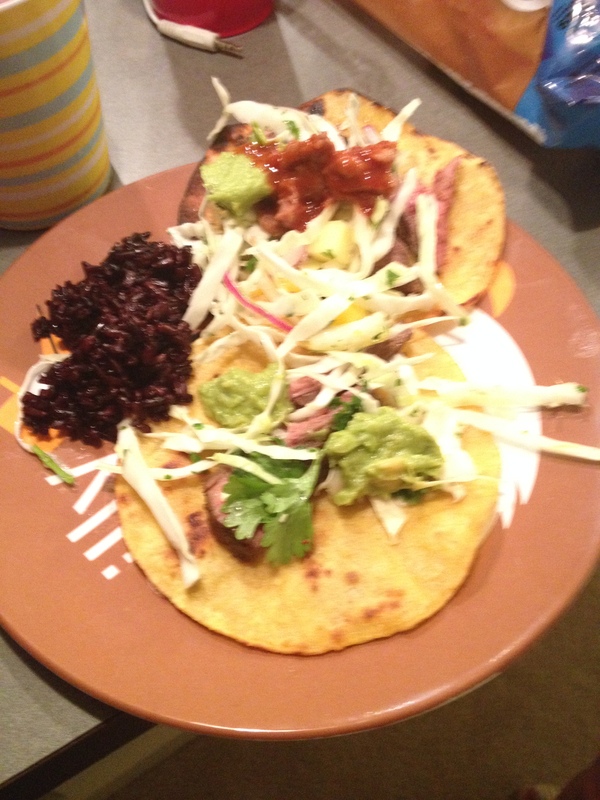 I have to tell you something – these are the best steak tacos I’ve ever made. Coincidentally the ONLY ones I’ve ever made as well. 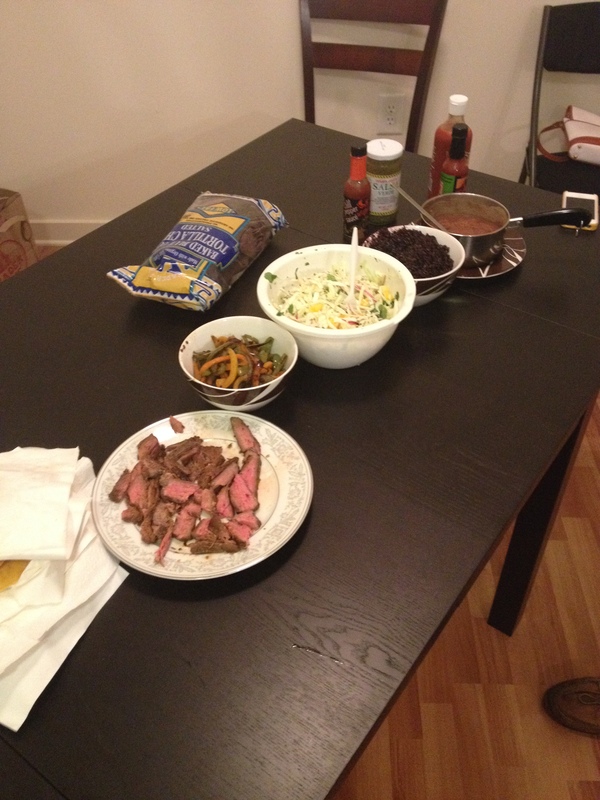 I haven’t entertained in a while and had it easy this time because I cooked with my friend Caelan – a gem of a host. The fact that it took us 30 minutes to cook a steak didn’t phase him a bit and I’m also very grateful he didn’t get mad at me for literally incinerating his pans while frying tortillas! Thanks Caelan! If you are going to make this recipe, please use your grill! It’s quite a simple recipe taken from mountainmamacooks, however we tried to cook the steak in the broiler and haven’t mastered that quite yet….SO, here we go. Are you loving loving loving summer? Or just one loving? It’s a triple loving summer for me. I just moved into an apartment with about 1 foot of counter space, have a porch swing, my roommate’s moving here in a week, and it’s the season for endless frozen yogurt. Let me tell you very briefly about a few things I’m triple-loving this June. My mom brought me three herb plants for my front porch which was the highlight of my week. Let’s all cross our fingers that they don’t get knocked over or stolen (yes, that’s happened). I’ve had some solid popsicles in the past month including a blackberry ginger one and a pomegranate margarita. There’s beer ice cream out there also. I ate a jalapeno corndog at a festival and discovered the sensation that is Trombone Shorty. Annnndddd I made these tacos. I’ve had this recipe on my pinterest for some time now, but I wanted to save it for a time when someone familiar with steak could help me out! Cue damsel in distress music. Honestly, this meal – while served about 1.5 hours later than expected, was fantastic. When I told my mom about how there happened to be enough for everyone, she said “like the loaves and fishes!” And I thought, exactly. It’s funny how there’s always enough, isn’t there? The more people that you are surrounded with, it seems that we’d all need more food to keep us going – but really the more good company there is, the less the food matters. Shoot, is this post becoming pointless?! I’ll post pics soon, then you’ll listen. When it is time for the partay, assemble the slaw while you’re preheating the grill/broiler. Try to slice the cabbage as thin as possible. Toss together all the slaw ingredients to let the flavors meld before cooking the steak. Grill the steak for 10-12 minutes (says the recipe it took us like 30 minutes including stoppage time to broil it) total and let sit for 5-10 minutes before slicing. To fry tortillas I used two methods. One was to fill a saute pan with half an inch of oil and fully fry the tortillas. The other was to fry them in just a thin layer of oil to make them thick. Either way I pretty much burned down my friend’s kitchen so maybe use flour tortillas if you don’t want to worry about this!! Serve family style and NOM! If you make these please let me know I’d love to hear how they turn out for you!